Soldier: 76 might even get to take some time off. A massive Overwatch patch dropped on January 24th, bringing about some changes that promote creative and aggressive team compositions. While we have already seen the beginnings of a meta shift at the pro level, the standard 2/2/2 ladder builds have become a whole lot more fun with D.Va’s health change, Roadhog’s “hook 2.0” and Ana’s Biotic Grenade nerf. Heck, Sombra has even been making more of an appearance with the hacking buff she’s received. If the NGE Winter Premiere finals were any indicator, we have some hard-hitting Overwatch to look forward to in the weeks to follow. The new and improved hook for Roadhog has given him a much more solid feel overall, with many people considering this fix to actually be a buff. However you look at it, one thing is certain: no matter which end of the hook you’re on, you’ll feel like the outcome was deserved. Though the hook does feel stronger, targets on the high ground may give you quite a bit of trouble. In scenarios where both Roadhog and DPS targets on ledges above need to be mobile, line of sight issues become more of a factor. Watch what happens here when Ghost’s ConnorJ goes in for a hook that he probably thought would put down Immortals’ GrimReality. In this case the result was catastrophic, as GrimReality went on to get a couple of crucial kills that helped secure a win on Nepal. This is also a perfect example of why there are some people who believe further work on the hook is still necessary. Regardless, in 50/50 situations, it still feels acceptable at the very least. That’s a major sign of progress. Perhaps one of the most pivotal changes in regards to the meta, D.Va’s decreased armor now makes her quite a bit squishier. Her Defense Matrix and ultimate are still valuable tools, but you’re going to notice a lot more D.Vas hopping around outside of their mechs than you did before. Needless to say, a tank without her tanking abilities is no tank at all. The following scenario is one that you’ll start to see more often on the ladder. Ghost loses their D.Va mech, and Luminosity’s Ube is free to Barrage them into the ground without fear of Defense Matrix. On top of the health nerf, her damage also took a hit this patch. Overall, she’s not that attractive of a pick unless you’re in dire need of Defense Matrix or a bomb in tight spaces. What makes this significant is that many players at all levels looked at D.Va as a big reason why the tank meta used to be so strong. It’s still very early, but here are some numbers to consider. In a 25-round sample from the NGE finals and semi-finals, D.Va was only used 10 times as a tank from start to finish. Compare that to Roadhog, who is widely thought to be a viable flex DPS option, being on full-time tank duty 22 times. Unless you’re a stubborn D.Va “main”, these numbers should suggest that you at least consider using Roadhog more often if you want to earn yourself some easier ladder points. The other reason why the tank meta was so strong was due to Ana’s massive spike healing potential. Now that her grenade heals for 50% less, her team will have a harder time surviving ult combos and burst damage. 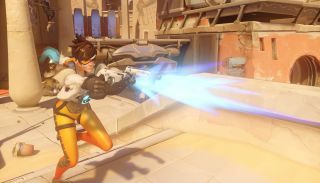 She’s still very good, as most Ana critics will agree, and there’s nothing like a good Nano Boost to turn the tide of a battle. It’s doubtful that we’ll see a decrease in Ana usage at the pro level, and those who have been successful with her on the ladder will likely stick with her. Soldier 76 is still going to be a very good choice on nearly every map, but don’t be surprised if we see characters like Genji, Tracer and McCree start landing frequent DPS spots going forward. The combined nerfs between D.Va and Ana will warrant the gratuitous usage of highly mobile characters as well as spike DPS characters. In the same 25 round sample discussed earlier, Soldier 76 was only chosen 16 times in total. Tracer, on the other hand, was chosen an unbelievable 39 times overall, 18 as a full-time selection, and 14 while on defense. Even Ghost’s star D.Va player, Mykl, was put on Tracer duty a lot of the time, which should tell you something about the type of game being played post-patch. Here’s Mykl giving us a taste of what Tracer’s mobility and burst damage can do for your team. It’s not unreasonable to assume that this trend will continue at the esports level as more tournaments come and go. OGN Apex season 2 should yield some valuable data, given how aggressive Misfits and some Korean teams were already playing. It’s fun to talk about how the tank meta is at its end, but the reality is that the ever-popular 3/2/1 (three tanks, two healers, one dps) build, minus D.Va, will continue to be viable in many situations. One interesting thing to ponder over is that 2/2/2 compositions were used as often as 3/2/1’s at the Wintere Premiere finals (30 times to 29 respectively in the 25 round sample) which, again, puts us at the brink of a meta shift at the pro level if transitional data means anything. In any case, chances are that you’ve already grown accustomed to the 2/2/2 build on the ladder, where a huge variety of options have a good shot at success. As this meta continues to mature, it’s going to be important to keep your eyes open for new or improved approaches to DPS. Who knows? Maybe even Sombra won’t be scoffed at anymore.